Blackhurst Budd continue to fly the flag for the Bathroom Solutions Blackpool and Fylde Sunday Football Alliance in the Lancashire FA Cup after they dumped out Preston side Acregate on penalties at the quarter-final stage. In an edgy first half , it was Acregate who took the lead after capitalising on a defensive mix-up. 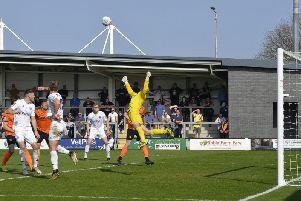 But just before the break, Brett Dawson’s cross looped over the keeper to take the teams into the half-time break all square. Midway through the second half, Acregate went down to 10 men and Budd took the opportunity to start dominating the play, which resulted in Dawson scoring his and Budd’s second. With the game in added time, the home side were awarded a controversial penalty to draw level, meaning the tie would be decided on spot-kicks. Player/manager Andy Speight stole the limelight with two great saves to send Blackhurst Budd into the semi-finals with a 4-3 win on penalties. Meanwhile, in the quarter-finals of the 50th Gledhill Cup, premier division side Appletree Finance proved too strong for Chris Allen Garages from the division below. Connor Williams scored two, while Sam Witter, Lewis Phillips and Javier Marques also hit the back of the net in their 5-1 victory, with Tom Ashworth bagging the reply. In the premier division, A&P Autos went level on points with leaders The Saddle as a Steve McEwan’s brace and further strikes from Dax Hoogerwerf and Matty Wannell gave them a 4-3 win over Exceptional Kitchens. Simon Williams scored two and Matthew Kirkham also netted for Kitchens. Kyle Housley and Jake Ratcliffe gave Eurotech Blackpool a brilliant 2-1 win over 21st Century Windows, for whom Robert Gradwell scored. In division one, Athletico Tijuana finished 2016 with a 100 per cent away record as Aaron Fleming scored a arace and further goals from AJ Greenwood and Matty Parr gave them a 4-2 win at FC Highfield. Scott Anderson scored both replies. And in division two, The Bridge went level on points with leaders AFC Albion, who didn’t play, with a stunning 14-4 win against King Edward. Simon Annetts led the way with four goals, while David Ireland bagged a hat-trick and there were braces for David Morris and Connor Riley, with Brett Jelly, Aaron Nixon and David Shaw rounding off the scoring. Rob Heritage’s hat-trick and Sean Willetts’ goal were in vain for Edward. Kenny Cram bagged a hat-trick as Broomheads Estate Agency beat Lane Ends 6-0, with Jordan Casey scoring twice and Danny Green also netting. Jonathan Gough set Westview on their way to a 7-1 win against Highlands with four goals. Kyrone Edwards, Patrick Fisher and Thomas Whittaker were also on target. Daniel Dean netted Highlands’ consolation. Blackpool Wren Rovers returned to league action with a 6-1 home win over Vickerstown in the West Lancashire League’s premier division. Carl Eastwood led the way with a hat-trick, after opening his side’s account in the 20th minute. The Barrow club levelled through Danny Cummings but Rovers’ lead was soon restored by Gary Pett and there was only one winner from there on. Danny Morris scored either side of the half-time interval and two more goals from Eastwood completed the win. Rovers stay in second place, 10 points behind runaway leaders Longridge Town who won 4-2 away at Eagley. Rovers still have two games in hand. Garstang also hit six with a thumping 6-0 win away at second-bottom Whitehaven. The deadlock wasn’t broken until Alex Colquhoun scored just after the half-hour mark. Five goals then followed in the second period, with Rick Coar bagging three of them and Alan Coar the other two as Garstang climbed to fifth. Thornton Cleveleys weren’t in action. Division one leaders Poulton went down to a surprise 3-1 defeat away at CMB. The visitors had taken a 17th-minute lead through Josh O’Neill but a disappointing second half saw them fall to their sixth league defeat of the season. Neil Holmes levelled the scores on the hour before goals from Danny Warburton and Danny Halloran clinched an impressive win. Poulton have held on to top spot but Haslingden St Marys are just two points behind with four games in hand. Wyre Villa beat Dalton United 4-1 at home helped by a Cory Harrison brace. An own goal handed them an early lead before Harrison struck twice in quick succession to make it 3-0 at the break. Jarred Bain netted the fourth before Fraser Shand scored a consolation goal for the visitors. Lytham Town’s game at home to Mill Hill St Peter’s was postponed.